The organization Overseas, based in Italy, has for more than a decade been one of LAFTI’s staunchest supporters. As I understand it, it was founded by Mario Cavani, also a founder or co-founder of Italy’s Banc Etica, a series of socially responsible banking institutions located in various parts of Italy. 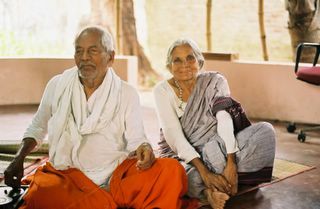 They have an ashram of sorts in the little town of Spilamberto, outside Modena, and have supported a series of Third World development projects, in Kenya, Sri Lanka, Brazil, and elsewhere. Apparently Mario and others involved in Overseas really hit it off when they first met Amma, and despite occasional bumps in the road often caused by the lack of a comfortable common language, Overseas has been there for LAFTI and for the people LAFTI serves in times of need. Krishnammal said this was supposed to be “an easy day”. On Thursday, the day I was to leave Kuthur on my trip home, we started by visiting the District Collector and Project Officer for Nagapattinam, both of whom have become staunch supporters of LAFTI. I gave my obligatory introduction at the meeting with the Collector, with a note that I saw the fruits of LAFTI’s labors in assembling the mountain of documents for the 1,059 families, and hoped that this spade work would prepare the ground for 5,000 more. Then it was down to business. Besides showing off her foreign visitors, Krishnammal had three requests. The first one was easy – she wanted the Collector’s blessing in meeting with the Chief Minister of Tamil Nadu next week (laying the groundwork for the request for 5,000 when he visits the area.) The second was that he write a letter proposing the stamp registration exemption; it being preapproved, the official request had to come through him. “Going through channels,” smiled Amma. The third request was a bit more unusual. Jagannathan has a “Freedom Fighters Railway Pass”. Having fought for India’s Independence, he is allowed to travel the Indian rails with a companion for free for life. Officials had occasionally complained about how much he uses it. “It is supposed to be for old men to visit temples, not for political agitation,” they asserted, but no one dared challenge him. Now that he really is too old to travel much, Krishnammal wants it extended to herself (she having been too young to be considered a Freedom Fighter), especially as the government is so often calling her to go hither and thither (something that is definitely not in LAFTI’s budget), as well as to go back and forth to Gandhigram while still directing the work in Nagapattinam District – she can’t stand the thought of not being able to hurry hither and thither; it is simply who she is. The Collector thought it a wonderful idea, and started the bureaucratic wheels turning immediately (we know because they called in the afternoon.) Then outside we went to take photos of all of us (I had the sense that the Collector was more anxious for a photo than we were; Krishnammal made sure that the green bag was well-displayed in front of her.) And then there was one of those strange leftovers from the British days. The Collector has a personal assistant, dressed all in white, barefoot, but with leather sash around his waist and across his shoulder, and the strangest headdress I ever saw (it looked like a hugh red and white striped bandage, perhaps attached by Velcro in the back?) He was worth the price of admission! Back in the jeep. We are off to Papakovil. As I reported last year, this village was hit hard, though indirectly, by the tsunami, but that’s just the tip of their woes. They live on a small piece of land, perhaps two kilometers from the coast, and, hereditarily, are a Dalit community of fishcarriers. Their land exists alongside the estuary, where prawn farms had cut down the protective mangrove forests, and even before the tsunami, their village had been flooded during the swelling tides and monsoon runoff. During the tsunami, numerous bodies floated into the village. This is about the saddest village of baked mud, with walls that are barely walls, and without the protection of a single tree, just some thorny bushes, that I have ever seen in India, and, given my 29 years of experience, that is saying an awful lot. (All right, it's not the poorest - Krishnammal took me to a village in 1981 where the people existed for four months a year on grass and snails. But I still think Papakovil is the "saddest".) Even the dogs seem to avoid it. When the tsunami hit, World Vision rushed to villages close by of higher caste fisherfolk, and began giving out aid in the form of cooking utensils, food, water, bedsheets, etc. Papakovil received not a bit of it. Following the tsunami, the headman of Papakovil, a truly tragic figure, appealed to LAFTI, which had been provided them with food as they were passed over by literally hundreds of international aid agencies, to try to find them some new land to settle upon. But in the rush of “tsunami assistance”, the former District Collector could not allocate the time (or interest) to the matter. As if to add even more insult, so many of the members of the 60 families of Papakovil, having lost their traditional occupation, some went to work for the “tsunami NGOs” (as they are known here). But, being all uneducated, many of them ended up carrying concrete and cement on their heads to be used in the construction of other people’s houses (and some of them, especially young girls, likely ended up as bonded laborers hundreds of miles from home.) Not a kilometer from Papakovil, World Vision is building a community of handsome houses (by Indian standards), perhaps 150-200 of them (I didn’t stop to count), for the fisherfolk (who also received new boats, and had their schools well-restored by World Vision, with a grant from Guidant Corporation – we got to visit them as well.) But not a single house, nor school, nor nursery was built for the people of Papakovil, who are still living in the same place. We drive the area around Papakovil. Abandoned, stinking prawn farms on both sides of the road, one right next to the World Vision development. I wonder if they’ve tested the water supply (I doubt it, but then in this dreary environment, I can hardly say I would blame them.) There are a few new ones as well, funded by our friends at the World Bank as “tsunami assistance”. The town of Nagapattinam itself looks much cleaner than before the tsunami, there is clearly a building boom of sorts (though with nothing that I can imagine might be called ‘city planning’); the fish market where 4,000 people perished has been leveled and rebuilt; there are new boats in the harbor (but no more fish!) The head of the fisherfolk community rebuilt his home; he is out when we drive by to pay our respects. The train station has not been restored. Lots of jeeps with stickers ranging from U.S. AID to Swamiji (Ravi Shankar, not the musician.) Life goes on. We visit an ancient site where some of the original 18 “siddhas” (rather like the Talmudic 36 wise men who always inhabit the world in the Jewish tradition, or the “Men in Black” for those of you more familiar with the movie) used to sit under a tree, which is now caged inside a temple. Krishnammal would have been happier without the temple, she says. I kid her, however, that, unlike Quakers (or at least modern ones, because it is speculated that this might have been common practice in the 17th Century), followers of Ramalinga light little lamps, purely as symbols, to remind them of the Divine Light within. “First a little lamp,” I say, "then a larger, fancier one; then an altar on which to place the lamp; then a a picture behind the lamp; then a room to house the altar that houses the lamp; then a house for the room for the altar for the lamp; then a church for the house for the room for the altar for the lamp; then a steeple for the church, then….” She laughs. “We have to keep it down to a simple lamp,” she says. But they want the land. They say they have spoken with the landlords – three brothers it turns out, and they are ready to sell. Krishnammal and her staff puzzle over this for a few minutes, and then she says that if they (the staff) can get negotiate a reasonable price, and finish the voluminous paperwork in the next two days, they will try to get land for these women made part of the package that was already submitted. If not, it will have to wait for September 11th, and the formal request to the Chief Minister to extend the program. I make a little speech about how the land was in fact already theirs – they and their ancestors have worked it from time immemorial, but have been deprived of its fruits. We want to make sure it is understood that the work LAFTI does is no charity program, but a social change approach that enables people to obtain what is rightfully theirs. After they leave, I mention to Krishnammal that today 31 women came; tomorrow it might be 62, and the next day 124, and…. So she must be prepared. “Everything is possible,” she smiles. Thanks for your excelent work on documenting the activits work. It is very inspirational. I would try to meet them when I go to India.